Only four days to go until we embark on our camping holiday in Cornwall. I am getting very excited! As I have mentioned in The Plan, I believe a good campsite is a destination in itself, somewhere you are happy to chill out, soak up the scenery and muck around with the kids. However, Cornwall is a pretty special part of the country and I am looking forward to exploring and seeing what is on offer. 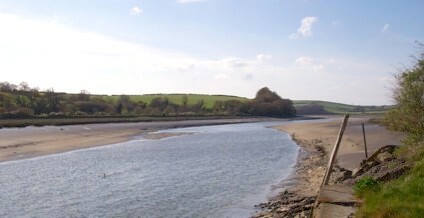 ‘One of the most popular recreational routes in the country, the Camel Trail runs from Padstow to Poley’s Bridge, via Wadebridge and Bodmin. 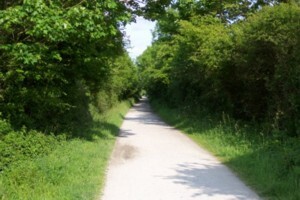 The trail passes through the wooded countryside of the upper Camel Valley and alongside the picturesque Camel Estuary – a paradise for birdwatchers. Bikes can be hired in Padstow or Bodmin. I know my girls will love this. The youngest has just about mastered two wheels but is still pretty wobbly and I’m sure the experience of a tag bike will really improve her confidence. It worked for the big one anyway! An extraordinary place. The amphitheatre, seats, stage and set are all carved out of the rock, set on the side of a cliff overlooking the sea at the end of the Lizard peninsular. I would love to see an evening production here but I was delighted to find they do daytime performances aimed at 5-11 year olds. Prices are extremely reasonable: Adults £4, Kids under 11 free, Kids 11 -15 £2! Check out their website for details of storytelling day time performances, booking in advance is strongly recommended. This is such genuinely unique experience we will definitely NOT be missing it. Stroll across the causeway where a legendary giant once walked. Follow the footsteps of pilgrims. Boat hop to an island where modern life meets layers of history. Discover a medieval castle, a sub-tropical paradise and a close-knit island community. Delve into the history of a fortress, a priory, a harbour and a home. It is a National Trust property, great for members and I think for the purposes of this trip to Cornwall I will be shelling out for a family membership. Cornwall is of course surrounded by sea but for pootling around on a small boat, personally, I prefer a good river. Helford River Boats run the ferries across the mouth of the Helford from Helford passage. They also hire out small self drive motorised or rowing boats. They also provide fuel, maps and safety equipment. This area looks so fantastically idyllic and I’m pretty sure the husband would enjoy a bit of river pootling too. The kids are obsessed with going on boats so in all it could be the perfect day out, it could also be combined with a trip to one of the NT gardens in the area such as Glendurgan which claims to have ‘special interest’ for families and includes a 176 year old maze and a beach! No, ‘Things to do in Cornwall’ list would be complete without a mention of the world famous Eden project. We visited some time ago when big one hadn’t yet learnt to walk. We did enjoy it and I would love to go again to see how it has developed. However, the prices are pretty astronomical and I do have other plans (see above). However, I have discovered that there are reduced ticket prices for summer evenings with promises of barbecues, jazz nights and such like. Arrive after 3.30pm on Tuesday, Wednesday or Thursdays during school summer holidays and pay Adult £13.50, child over 5 £5. I know it’s still pricey but compared to the usual price of £23.50 per adult and £9.50 for a child over 5 (is this the most expensive attraction in the UK? ), this does make it slightly more palatable. Of course the glaring omission in the list of activities in Cornwall is visiting the beach. As I have not yet experienced them myself I find it hard to comment. Fortunately for me Emma Bradshaw of the beautiful blog Bradshaw & Sons has just written a handy post about the Beaches of Cornwall. This will certainly do me as a start! For a comprehensive guide also look at Cornwall Beach Guide. Emma Bradshaw has also written a post with some handy local knowledge tips about great things to do in West Cornwall, have a look! Wow, Cornwall really is looking pretty amazing isn’t it. Do let me know of any really special places you recommend! Campsite Review: South Penquite Farm, Bodmin, Cornwall. 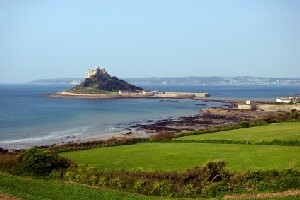 I never knew of St Michael’s Mount before, it reminds me of Mont Saint-Michel in France. Now I have to visit both!! I’ve always wanted to visit the Eden Project. A mate of mine used to talk about it endlessly, he lived nearby, and never got tired of visiting. It is very similar to the one in France isn’t it. Thanks for the comments, glad you enjoyed the post! Looks like you have had a fantastic explore in Cornwall! We went at Easter and stumbling upon a lovely beach near Fowey called Polkerris. We even saw Richard and Judy there! So good, we are going back again this summer. Minack Theatre was probably my favourite thing, apart from all the lush beaches of course!